I hate it. I dislike saying goodbye. When I meet a new spirit I never want them to leave. And so it is with a few of my blog friends. I am sad that I have had to cut you loose from my favorites list, but then it really wasn't my doing. They have either left the blog world or have retreated for more then 6 months and not sure if they will return. I understand. I do and I will miss you but it is time that I clean out my space for others. You have gone away because others are coming. So I have added new blogs. Some are long time bloggers newly discovered by me and some are brand new posters to the blog world. I welcome you all and wish all those who have left well. 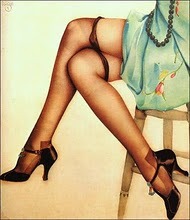 Garter Mademoiselle - how cannot you not love a name like that? A new blogger, her posts are delightful as she shares her love of silky drawers, garter, and all things romancing ribbons creative. A Jersey gal now living in Germany, she shares her vintage finds found in her European travels. Dear Helen Hartman is like Dear Abbey on junkin crack. As she writes, "This is the South! Too much food, too much jewelry or too much hairspray, there is no such thing. In this part of the country, too much of anything is just about enough...But I do believe I'd have stopped at giving the dummy a gun! Oh wait, that has never been a prohibition against dummies with firearms 'round here." We even have a term for an abundance of blessing here in the South. It’s called a gracious plenty." 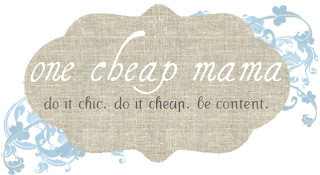 One Cheap Mama...she had me at cheap mama. A mother of two and a mom of one with caviar taste and a sardine budget so she does the best she can to feed, clothe and decorate chic and cheap. From Louisiana Y'all. In these crazy economical times, it's great to have a leader "on the cheap" to help us navigate our financial opportunities. Between my corporate job and my sista's we have been busy missing each other on the weekends. We usually "play" on Saturday with a day of junkin, lunching and gossiping. Mind you, we live up the street from each other and we email/talk/facebook all of the time so it's not like we don't see each other. Still, baby sis and I just always have a great time together and Saturday was our day to play. 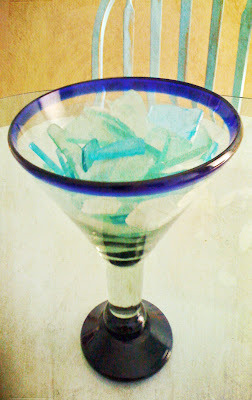 We always have stuff to give each other so while sis was getting her handbag together, I snapped this with my iPhone of seaglass in a big martini glass sis had on her dining room table. A little of Kim Klassen's overlaying techniques and this is the artistic outcome. I love it...looks so Key Westie to me and yes, the perfect martini for a sea witch. First stop was Fry's...had to pick up a splitter to hook up a second monitor for my home PC. A girl can never have too many shoes, handbags or monitors. From there we grab a little lunch and then off to Goodwill for some junkin. Haven't been to one location in a few months and it really paid. Along with treasure from a few other locations I came across some good finds. Nice West German lidded stein. Three of these English transferware dinner plate with hand painted details. Pretty scalloped edges. 1931. Three dinner plates, Wedgwood Wellesly pattern. 1931-1957. Larger then a dinner plate, this decorative element is as light as a feather so it can be hung inside or out. Lovely muted shades of wool on this modern Navajo rug. Everyone woman needs a sassy, red hat. These were in my house. I finally came across a bucket bench in faded seafoam and now these can move on to another's home. I adore antique bucket benchs and actually had these stacked 5 high. I have two more that I will eventually move on to the booth. The bottom bench still retains its original milk paint and has octagonal legs. The small one at the top is the cutest and no more then 10 inches by 8 inches by 6 inches. The Navajo rug looks pretty with the three lanterns. How clever is this? This is why I adore Queen of Hearts. So many clever decorating ideas. This designer rolled up sheet music and filled candelabras and scones with faux candles. I love this idea. And one final treasure find that is now sitting in my sista's kitchen until she tires of it and then returns it to me to sell. Yea, that happens often. Sis loves to redecorate and she will see something that I have found and then asks if she could live with it a while. This cutie only had 3,000 made and books at about $195.00. Who knew? I paid $10.51 so no complaints from me. It may be a while, though, before sis gives it back. When you open the top of her bottle, little "Jeannie is sitting inside" guarding the cookies. It is too cute for words and looks great in her kitchen...for now. It was a lovely day with sis and as we ended the day with a side trip to a favorite haunt, we noticed this sign and had to take a picture. Again, it was an iPhone shot so I added an overlay technique of Kim Klassen's to clean up the shadows and give it a more painterly look. We never did get dive bombed by the overprotective mother bird, but it sure would have been fun to watch. Time for a new header. Cropped this photo so I could zero in on this school of Yellowtails (Yellowtail Snapper) and liked the way it looked. 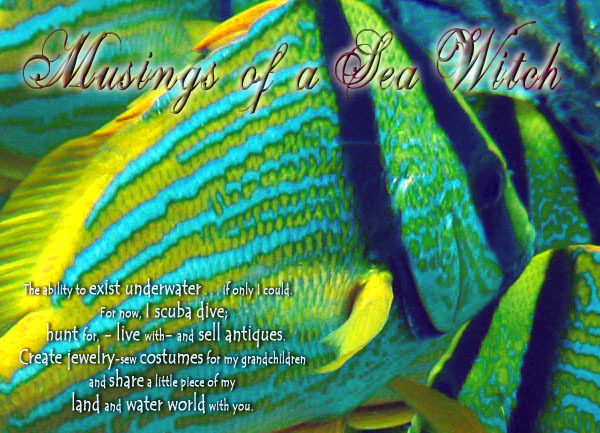 Perfect for a new header and these fishies are such pretty little things. Below is the original photo. I managed to get pretty close to them as they exited out of a swim through. There were huge schools of these in Cozumel, always full of color and curiosity. Mostly, they were just looking for food as many dive groups will bring fish food to get them to swim around their divers. I don't care for the practice as it takes them out of their natural environments to obtain food from man rather then naturally in their home the reef. These were a nice healthy size, about 8-10 inches in length. Brilliant yellow, they will follow you around if they think you have fish food. So much going on that I'm playing catch up again. I'm not the only one busy with life as I see so many blogs I love have disappeared and other bloggers have either taken an extended break or just stopped blogging altogether. I miss them but understand that life throws "stuff" at us and we must adapt. I have also slowed my posts down these past few months for the same reason. So much is going on at my corporate job that I am hard pressed for time anymore. Hopefully, that will slow down in another month or two as I miss blogging and especially reading all of the different blogs I adore visiting. Finished and shipped Miss Kit Kat's birthday princess gown. She had specific fabric colors and requested lots of sparkles. And of course, a sparkly crown with crystal hearts that move as she does. My sweet 6-cheese ravioli just loves her pink and purple gowns. 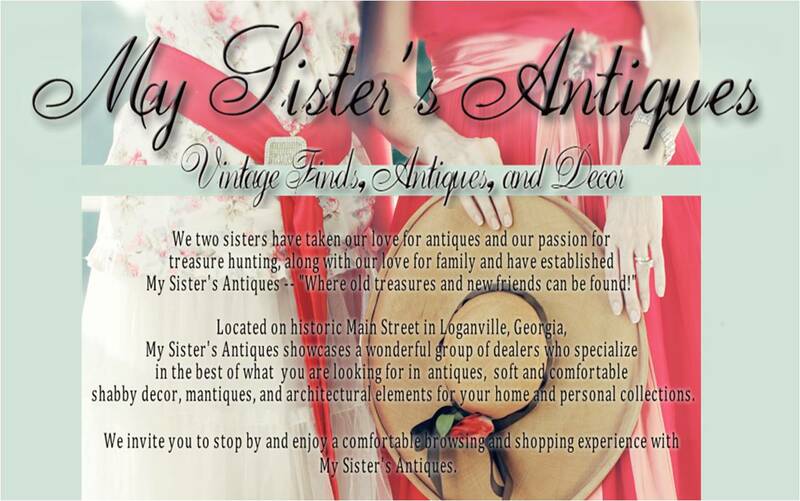 Designed and created the website for a marvelous local antique shop called My Sisters Antiques. Website is fully launched and includes the lovely photography of Robin Ewing. Located in Loganville, GA, it is owned and run by two sisters, Angie and Cristy and of course their beloved dogs, Spanky and Chelsea. These ladies are marvelous women and adore antiques as much as those folks who come in to the shop to buy them. They have terrific dealers, as well as what the sisters bring to their shop, and offer the shopper a wide variety of antiques, mantiques, vintage and retro items and everything shabby you could want. One of my favorite places to shop for myself. If you are ever in the Loganville area, My Sisters Antiques is a must stop for treasure. Got a little treasure hunting in on Saturday. Not alot of finds, but the few pieces I found I was thrilled with. A huge 19th century soft paste platter with unusual dark green trim. Marked Staffordshire ADAMS, this huge platter has served lots of tasty meals. I'm kinda hoping it won't sell as I would love to serve Christmas turkey with all of the trimming on it this year. A killer find. Victorian, cut crystal tulip bowl wine glasses from the 19th century. Extraordinary stemware that reflects light like diamonds. A close up of the stemware. I adore vintage wrought iron or aluminum pieces. This hanging lamp is so retro. A lovely Victorian parlour tablecloth. Cutwork, crochet fillet and knitted edges accent this neat piece. I am a sucker for these mid-Victorian condiment servers. This quad platted server has cherubs all around it it and all of the condiment cellars. They held oil and vinegar, pepper, sugar, honey and whatever local sauces that were used in regional board of fare. My first memory of these servers was as a child. 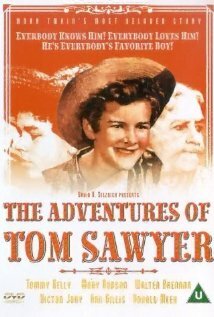 I saw one in the 1938, black and white Tom Sawyer movie. Aunt Polly had one sitting in the middle of her dining room table. Talk about period authenticity. Tom's adventures were set in the early 1870s and this 1938 movie kept the period details accurate. I guess I was bit of a "movie snob" at a young age. LOL. Still, to this day, if the details aren't right in a film it will annoy me to no end. 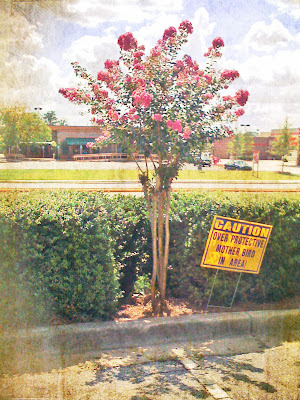 It's hot hot hot in Atlanta with temps in the high 90's most of the holiday weekend. Thankfully, we had a few storms come in later in the day to cool us off for an hour or two. Early morning sky was a great lavender color as I grabbed the dog and went for a bagel run. I picked up a few Six Cheese bagels for my honey, fried up some Taylor Pork Roll slices, add peppers, onions to an omelet and then top with a slice of melted Swiss cheese. Added all of that to the Six Cheese bagel and you have breakfast heaven as my honey calls it. Einstein Bagels also has "doggy bagels" and Kota adores them. He knows the route and loses his mind until I come out with the doggy bagel in my hand. Following breakfast, I went treasure hunting early Saturday morning and found some interesting pieces and along with items from past treasure hunts, I was able to fill in some of the empty spaces in my booths. Sold most of the free standing china heads so I brought the rest in. Have a few odd ones left and have Halloween plans for those. Since the heads did so well, it was time to bring in all of the hands and leg pieces that I also have. 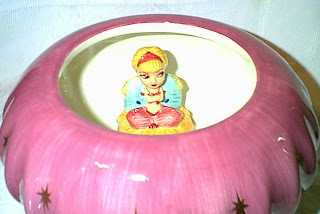 How sweet it this little, Prussian handpainted lidded sugar bowl. Lovely, soft white cabbage roses on both sides. Circa 1900s. Talk about a find...this lovely Royal Munich hand painted biscuit/cracker jar. In excellent condition with pretty gold lustre trim. Book value $98.00...purchase price $6.00. Pretty heart pillow constructed from antique quilt. Shabby cottage at its best. Another lovely find. American Brilliant, cut crystal and very heavy medium size floral vase. 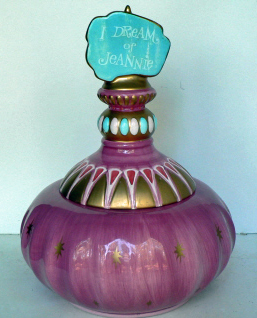 This baby has marvelous color and light and is typical of the Victorian vases that graced so many tables. Jackpot...a set of six, count'um six Bakelite Scottie napkin holders. Picked these up for $18.00...book value about $95 each. My antique treadle sewing machine sold so I had to bring in another piece of furniture. On a trip to Clarkesville, I found this lovely secretary's desk at a local shop. Needed lots of TLC but it was worth it. I love the rich Tiger's Oak patina and brass locks on the pair of drawers with original key. Inside, Court Justice I. Homer Stuben's letterhead and envelopes from the 1920-30s. Desk is 1900s. The pretty oil lamp on the desk is electrified. Now I just have to find a chimney that will fit it. Pretty little Victorian print called Angels of Prayer. Original shabby frame with bubble glass and wood backing. Large globe from the 1960s. Great coloring and the paper globe is in excellent condition. I am always attracted to globes...must be my love of travel and history. Crazy about this bottle brush wreath in aqua blue. Can this be more 1950s? I may have to keep it as it is very Sea Witchy to me. I adore the Cupid's series of prints from the Victorian era. this lovely cupid "Awake" is hand colored and in the original tin frame. A honer marine harmonica that plays clear, a neat Carnival Glass commemorative bell produced for the American Carnival Glass Association 1975, a milk glass plate and a heavy silverplated serving dish. Wishing everyone a safe and happy Fourth of July.